We’re quite used to the anecdote of phones exploding in the past. However, Apple is probably not the first name that comes to your mind when you talk about catastrophic hardware failure. But the recent news about Apple’s AirPods exploding will definitely give you some chills. According to a report WFLA, Apple’s wireless earbuds allegedly started emitting smoke while a Florida man was working out in the gym. Jason Colon said, he was listening to dance music at an LA Fitness when the right side of the wireless earbuds started emitting white smoke. 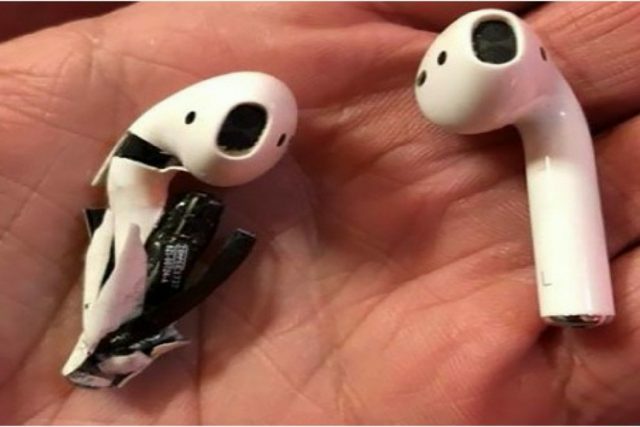 Leaving them behind to get help, Colon returned to one AirPod earbud being completely destroyed. As of now, it is not entirely clear as to what caused the AirPods to malfunction. According to Colon, the AirPods battery malfunctioned causing it to burst into flames. WFLA says it reached out to Apple about the incident, but there’s no word about the cause. Apparently, Apple is currently investigating the issue and will be in contact with Colon to obtain more information. That being said, this isn’t the first time an Apple product has made it to the news for such issues. Recently, we heard about two back-to-back Apple iPhone explosions in two different Apple Store locations as well. Now, let’s hope that we don’t deal with such issues in the future.